There is making a statement, and there is MAKING A STATEMENT. Your shimmery gold eye shadow makes a statement. Heck, your awesome gladiator heels even make a statement. And you thought that you had a dress that MADE A STATEMENT, but really it just made a statement. But now, there is something to make the all-caps bold-lettered statement you’ve been wanting. These Gold Theatrical Wings don’t just make a plain old fashioned statement. No they MAKE A STATEMENT. A loud, look at my might, and power kind of statement. These are the wings a goddess would wear. The kind of woman who can become the sun. 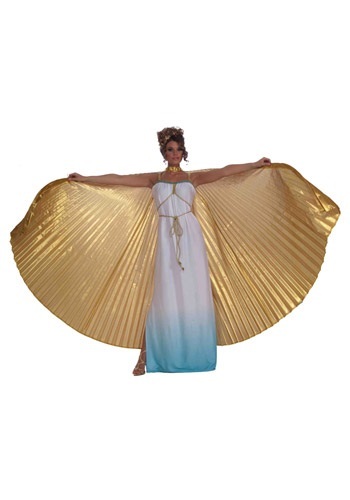 Additionally, it will keep the wind off of you as you walk to the biggest party this year. Measurements will be available within 24 – 48 hours of the product arriving. The wings are stunning with my outfit. I am quite pleased with them.